The family and friends of a man who died when a tree fell on a car he was in have paid tribute to the adventurer and world traveller. Saxon Bowes-Crick, 46, who lived near Haywards Heath, was killed on the A308 in Egham, Surrey, on 17 February. The other four occupants of the car were taken to hospital for treatment to minor injuries. Mr Bowes-Crick's family said he "touched so many lives" while a friend spoke of his "unbreakable spirit". 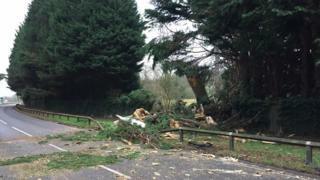 Mr Bowes-Crick, who was a tree-surgeon, was declared dead at the scene after the tree, on private land at the side of the busy road, crushed the car in which he was a passenger. Surrey Police confirmed his identity and said an inquest into his death had been opened and adjourned. Mr Bowes-Crick's family posted a tribute on his Facebook page, saying: "All great journeys must come to an end, and even for the indomitable Saxon. "You've travelled far and touched so many lives along the way. Your adventures will never be forgotten." According to Mr Bowes-Crick's Facebook account, he was a triathlete, Land Rover enthusiast and keen adventurer, skiing in Australia, ice-climbing in the Rockies and bike-rafting in Mexico and Mongolia. One friend, Mark Jaehnchen, wrote: "When I tell people about the travellers I look up to, the ones who really go out and explore, I tell them about this wonderful human I met cycling the desert with a packraft and his unbreakable spirit." David McGill spoke of his days working with Mr Bowes-Crick on his tree-surgery business, based in his home village of Chelwood Gate. He wrote: "He was such a conscientious tree guy and put hectic attention to detail into even the smallest jobs."